Special Containment Procedures: SCP-458 is considered safe and therefore is to be stored in the staff canteen at Site 17, with no access restrictions required. 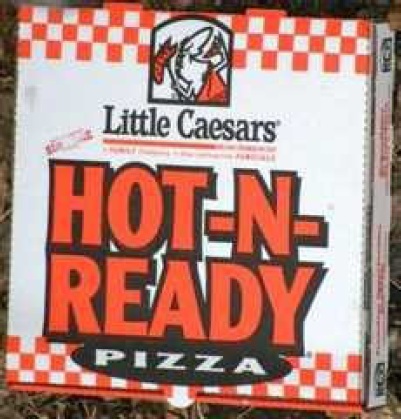 Description: SCP-458 is a large-sized pizza box from the pizza chain Little Caesar's, of their Hot-n-Ready variety. It is made of simple cardboard, measures 25.4cmx25.4cmx2.54cm (10inx10inx1in), and weighs about 20 to 20.49 grams depending on toppings. As a result of the unusual nature of SCP-458, measurement of weight is inconsistent. What makes SCP-458 an oddity is that, while appearing to be an ordinary pizza box, when it comes into contact with human hands, it instantaneously replicates within it the holder's subconsciously preferred choice of pizza, down to the favorite sauce, cheese, crust, and topping. It is not limited to the Little Caesars brand, as pizza from all major pizza chains, as well as local and even handmade pizzas have been produced. There seems to be no limit to its ability, except that it cannot make anything but pizza, and its toppings must be edible by normal human standards (see Addendum 1a). The box is also rather indestructible, as all tests to destroy or dismantle the box have proven fruitless. It is assumed the box is semi-sentient, having at least enough telepathic or empathetic ability to sense what the holder's personal choices regarding pizza are. After constant testing showed SCP-458's seemingly infinite power to generate pizza (but with little other use), it has henceforth been placed inside the canteen at Site-17 for free use by personnel. After its open usage has been allowed, personnel morale has shown to have sharply increased. Addendum 1a: Upon testing SCP-458 with SCP-███, the subject took a bite of the slice, which appeared to be a garlic-free slice of sausage and olive pizza on wheat crust. This was met with the response "It's a fine slice, but I would have preferred a rather different sauce." It was inferred that the box cannot use substances that are indigestible by regular human bodies. Further testing confirmed this. Document #458-1a: I would just like to remind all staff that just because we have a pizza box that can constantly create pizzas for you does not mean that you can just sit around and eat pizza all afternoon. If continued abuse of the box continues, coupled with reports of personnel gaining unhealthy amounts of weight, I may be forced to implement a mandatory physical training regimen following lunch hours. Document #458-1b: For simple curiosity's sake, and to, perhaps, get a better idea of the mindset of certain SCP's, I have compiled a list of sentient SCP's reactions when holding the box. SCP-040 Small, extra cheese, cheese stuffed crust. SCP-056 Medium, sliced bell peppers, thin crust, alfredo sauce. SCP-076-02 Large, meatballs, pepperoni, bacon, Canadian bacon, sausage, hamburger, thick crust. SCP-105 Small, olives, wheat crust, thin. SCP-108-01 Large, pepperoni, thick crust. SCP-134 Small, onions, anchovies, olives, thin crust. SCP-182 Medium, olives, mushrooms, pretzel dough crust. SCP-343 Large, almost every topping imaginable, with over 100 distinct foods identified. SCP-3477 Medium, anchovies. All instances produced identical pizzas, with identically arranged toppings. Further testing on SCPs may reveal some odd characteristics about the SCP's themselves, and is suggested. Further cross-testing is permitted but requires approval and supervision due to safety concerns. 1. Almost immediately after opening SCP-458, the produced pizza began to go through symptoms similar to other organic material within SCP-073's effect radius. Experiment was retried, with the pizza being removed from SCP-458 immediately after its opening, with minor deterioration present. When queried by researchers, SCP-073 stated it had never ingested products created by SCP-458. 2. SCP-181 was told that this was a reward for good behavior, and that it was a lucky guess that it was his favorite type of pizza. 3. SCP-4999 shared the pizza with D-430276, who was suffering from end-stage renal disease. Notably, this was the same variety D-430276 frequently shared with her late partner, and the first known case of SCP-458 accommodating a pizza which exceeds its volume.